There is nothing more relaxing than waking up at the Heritage Le Telfair Resort, hearing the sound of the Indian Ocean, with a gentle sea breeze, whilst listening to the peaceful melody of the tropical birds. And when it comes to a world class dining experience, you can enjoy the option of 12 different restaurant and bars on the Domaine de Bel Ombre, from Mauritian, Japanese to French cuisine. The Heritage Golf Club is ranked as one of the best courses in Mauritius, set on an idyllic piece of land between rolling mountains and the turquoise lagoon of the Indian Ocean, the setup at the Heritage opens up an enjoyable but challenging experience for all standard of golfers. In addition to enjoying a spectacular setting golfers will be blown away by Matkovich's tournament standard golf course, a par-72 proposition that can be set up to suit players of all standards. Set against the backdrop of the tropical island's volcanic mountains and offering amazing views over the ocean, the Heritage Golf Club at Le Telfair is without doubt one of the most incredible golfing experiences anywhere. 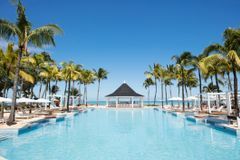 The resort at Heritage Le Telfair takes inspiration from the traditional colonial architecture of Mauritius' traditional sugar cane era mansions, offering outstanding luxury accommodation. In total Heritage Le Telfair boasts 158 rooms and suites that ensure that guests will enjoy 5* luxury from start to finish. Floor to ceiling French windows, private verandas and balconies present spectacular sea or river views. Interior facilities include a separate living area for Senior Suites and above, individually controlled air-conditioning, electronic room safe, satellite television and a spacious deluxe bathroom. Suite guests will enjoy 24-hour butler service as part of the experience at Le Telfair, which is among the most luxurious 5* golf holiday destinations. The Six Senses Spa at Heritage Le Telfair is a sanctuary in the tropical gardens where guests can truly relax; included in the collection of treatment rooms are two outdoor gazebos and a water hideaway, together hosting you for a selection of the most indulgent health and beauty therapies from the Seven colours spa Millesime collection. Le Telfair is a culinary feast where visitors can enjoy a number of international restaurants including the excellent Annabella's and the fine Italian dining. For a special treat guests can indulge with refined Mauritian Cuisine in the amazing Chateau de Bel Ombre, a 19th century manor house set in 100 year old tropical gardens at the heart of the Bel Ombre estate. 1. We could not accept the first and second room offered to us because they were located at the swimming pool and one of the restaurants. 2. Quality and preparation of food (without paying supllements) was not worth a five star hotel. The hotel has a great ambiance staff are always helpful and polite. The food is well prepared and there is a good variety of menus There is a choice of restaurants . 2,500 Rupies for the rent of one buggy is very questionable. This is one of the best courses I’ve played. It is in beautiful condition. There is a choice of tees according to handicap .There are no particularly easy holes each needing careful placement of your tee shots . The greens have subtle borrows and pin placement can make approach tricky. The only issue with the course is that the green fees are included in the hotel cost , whilst this makes for good value this tempts a lot of players who are not golfers to try their hand this can make for slow rounds. I understand that this is being addressed in the near future when a separate green fee is to be introduced in the meantime serious golfers can avoid this with early tee times avoiding the crowds.